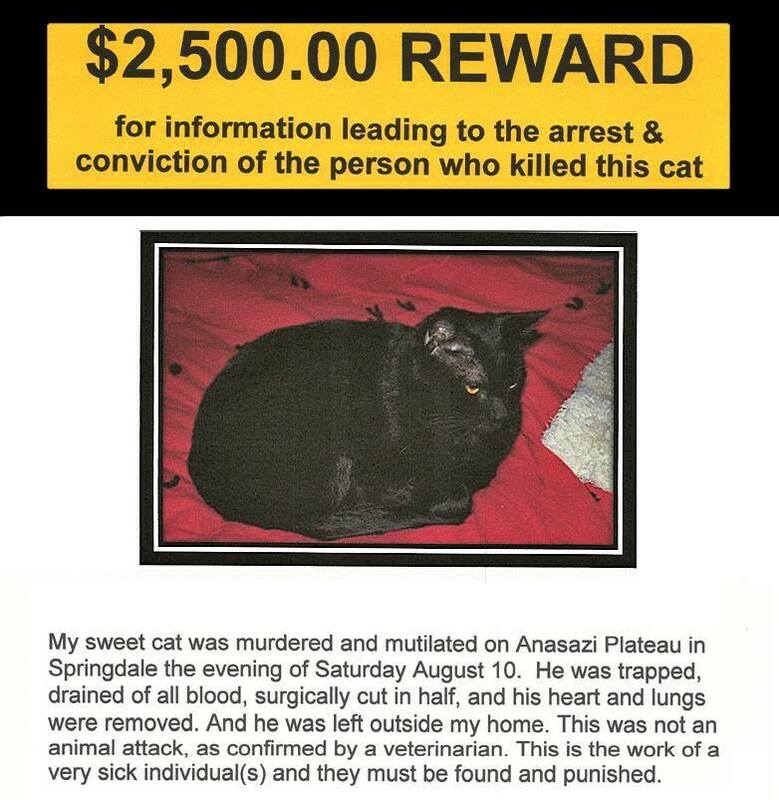 SPRINGDALE – Horrified pet owner Sherry Teresa found her cat dead and mutilated Saturday night on Anasazi Plateau in Springdale and is offering a $2,500 reward for the arrest and conviction of the person responsible. The potential case of animal cruelty has a Springdale neighborhood on high alert after the cat was found severed in half. Teresa said her cat was trapped, drained of blood, surgically cut in half and had his heart and lungs removed before being left outside her home. Sherry Teresa’s 11-year-old cat, Khepri, before his death. Teresa’s 11-year-old cat, Khepri, was lying in her lap while she sat in a chair reading a book until about midnight Saturday. Teresa then went to bed, leaving her sliding doors and windows open for fresh air. Teresa said Khepri normally wakes her up in the morning, but on Sunday morning, when she awoke at about 7 a.m., Khepri wasn’t there. After searching her two-story home for her cat, Teresa went out on her balcony and saw a black lump about 100-125 feet from her home. Teresa said she has seen a lot of animal kills, and typically when another animal has done the killing, you don’t find the carcass because the animal has carried if off to eat, but Khepri’s remains hadn’t been disturbed at all. Teresa picked Khepri up and wrapped him in the towel. After she got home from church, Teresa said she carefully looked at him again. As she became more convinced Khepri hadn’t been killed by another animal, Teresa kept the cat’s body cold and took him to Dr. Casey Wittwer at the Zion Veterinary Clinic in Hurricane Monday morning. The report from Khepri’s autopsy, which was performed by Wittwer, said all of the cat’s organs had been removed except for the colon; there was no blood pool and no punctures on the remaining body. The square section of body missing appears to have been cut with surgical precision. The lines are too smooth to have been a wild animal. The remaining bone fragments from the ribs and pelvis are fairly smooth. Due to the symmetry of the cuts and the straight lines, I suspect a knife or saw was used. The broken jaw and damaged nails are probably from the captor hitting Khepri and him fighting back. In the final diagnosis listed on Khepri’s autopsy report, Wittwer ruled the cat’s death as being due to human-caused mutilation by a blade or saw. Wittwer said they will save Khepri’s body for a week prior to sending it out for cremation to see if the city of Springdale wants to do any forensic testing. Springdale Police Sgt. Garen Brecke said the case is under investigation and declined to comment on any speculations as to what may have caused the cat’s death, but he said they have never seen anything like this in the area before. Brecke said he doesn’t think DNA testing would be performed in an animal cruelty case. In the meantime, Teresa has been busy putting up flyers around Springdale, Rockville, Virgin and Hurricane and is offering a $2,500 reward for the arrest and conviction of the person responsible for Khepri’s death. She said she believes somebody has to know something about the killing. She also said she no longer sleeps with her doors and windows open and that she sleeps with a gun nearby. Where we live, someone had to have been watching me because this took a lot of prep – they had to trap this cat, they had to remove him, do what they did to him, and then they had to come back and place him. Anyone with information regarding this incident is asked to contact the Springdale Police Department at 435-772-3434. The don’t think they would do DNA testing on an animal cruelty case? In this situation I think in the interest of public safety that they should do anything and everything to catch this person. It truly is just a matter of time before this sicko attempts to do this to a person. I FULLY AGREE!!!!! And sherry is right, this IS how serial killers start! People like that need to be stopped. Best by a round of bullets in his chest. This guy is EVIL and People like that can’t be healed. They aren’t stupid! He knew exactly what he was doing so to claim insanity afterwards, as many like to do is scary beyond recognition! The Springdale PD should not take this case easy or brush it off as just an animal. This was extremely detailed work! Glad sherry has a gun! OMG! WHY?! HUNT THE SOB DOWN AND DO TO HIM WHAT HE DID TO THAT POOR SWEET KITTY! What if it’s discovered that some good mormon boys are doing this? Will this story suddenly disappear. Kook laid. I think it was you!!! Your such a hater … GET A LIFE! IMOA, around these parts, it seems the good mission served or temple worthiness is the ticket out of jail and the issue disappears. That is horrible and I am sorry for your loss. I would be devastated. Something evil is going on, because there was just two puppies beheaded and found dead outside of Salt Lake City (I saw on the News). I also heard something about beheaded dog or dogs in the Reno area. I wonder what is going on. 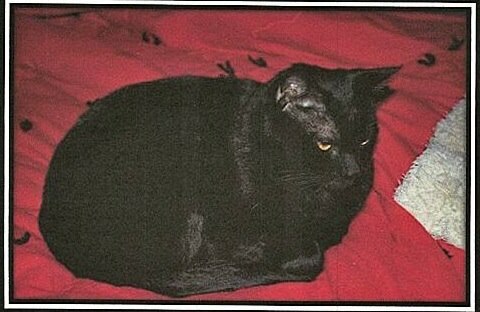 And you know there were satanists involved because this was a black cat. *Laughing* You took the words right off of my finger tips! Leaning more towards racist than satanist…. The scary part is, that this person could possibly just be walking around like everything is a-ok after doing something like this. If they can walk around without that on their conscience, without any problem , then they are capable of many demonic things. The chances the person that did this lives alone is small. Someone knows, or suspects. Don’t fear this creep. Call it in anonymously. It may be your own life you’re saving.And the chances of the person that did this living alone is small, so someone knows. Don’t fear this creep, call it in anonymous. If this person can do this to an animal, they can and probably will do it to a human. At least keep a sample of the possible DNA containing parts. But if anything else happens to a small child or adult there it could possibly be used as a link. Never discard DNA! Please do not let this go as an animal control issue. This is a Person that needs to be found at all costs. You know this is more serious than a hate or disregard for cats or animals. It is additionally disturbing the suggestion there may NOT be DNA testing done under the cats claws. This THING (individual) was up prowling REAL LATE and then took the cat BACK at its home for heaven sakes. That is a message too YOU! PLEASE KEEP THE COMMUNITY INFORMED ON WHAT IS TRYING TO BE DONE IN THIS CASE. PLEASE! Very disturbing…this person could very well be a serial killer in the making, DNA testing is probably a good idea, if they could find this person and get them psychiatric help they may be able to keep him from excalating and turning into everyones worst nightmare…..just saying. Springdale police chief. Do a dna test please. Help catch this person quickly. I’m afraid for my family and friends also whoever else this demon wearing human skin may come across. Please stop this before this demon kills a person. This needs investigation all directions midnight to 7am ?? Foul play seems to questionable. Some one close to home many??? The person, or persons who did this obviously do not believe in karma as I do. Something very, very bad will happen to them. Maybe not today, but soon. My name is Sanjour I like koolais it’s refreshing and then I pee it out into the john the koolais is flushed down the sewer it goes and the koolaid then mixes in with other urine and fieces they blend to make a toxic waste with horrible smell. As you can see, the comments prove Koolaid is that same waste. You can also tell they were sexually abused. Koolaid mother koolaid father must also swim in the sewer. The fowl stench from their breath poisons the rest of society. In my country we would take koolaid into public and expose his true identity and flush him into his eternal reward, This frothy foam of waste awaits him as he drowns in his and our expelled waste, for Koolaid will drink this up to quench his thrust in the hell below. There are worse things that happen! Like leaving your infant child in the backseat of a hot car! Why pull DNA from a cats claws to catch the perp charge him with killing a cat and not charge a mother who kills her child. What is the justification for this…? Josh, you’re right that the loss of an infants life does trumph that of a cat (which is hard for me to say being an extreme animal lover) but the reason this is such a hot topic is that most seriel killers and some psychopaths have a history of animal mutilation. It’s about the fact that we could have a criminally depraved individual in our neighborhood. So there could be worst things that happen, like this person moves on from killing cats to something worse…….let’s hope they are caught or seek help before that happens. WOW every time I see one of your posts regarding an article not even related you keep bringing up the issue of child left in car….do something about it or please stop bringing it up. It’s not relevant. Can you stick to the issue at hand ? This is extremely frightening. I’m reminded of certain serial killers, particularly Jack the Ripper. There was some surgical precision to his(her?) killings as well. The person who has done this clearly needs some help before it continues and/or escalates. Wow, this is very creepy and disturbing. I feel for Teresa. Not only does she miss her companion, but fears for herself at night. I hope law enforcement takes this very seriously and keeps a close eye on her home. The sicko who did this must be found and stopped. I’m wondering if the police won’t submit the DNA, can a fund be started to pay for Teresa to have the DNA sample ran herself? If it’s just money that is the issue to the police…sheesh. Does anyone find it odd / disturbing, the comment that was submitted by “Sanjour” on August 15, 2014 at 9:10 am? – If there is any way to trace a submitted comment (IP Adress) on these stories, I would definitely start with questioning this person! I wonder if the herd who believed in what B Young said about black people also applied to that to black cats? I’m the owner of the cat that was killed. Thanks to all of you that expressed sympathy. I will be keeping the DNA samples and will have it tested myself. FYI, the reward is now up to $5,500 and growing thanks to the Humane Society of Utah and generous friends. Please help me find this person! Thank you! I’m glad you are planning on running the DNA. I think that is an important step. I hope you are feeling safe these days. Sherry. Are there ANY developments at all? Are they trying as hard to find this killer as much as they are trying to find the person that shot the Pitt with arrows the other day? I FULLY AGREE!!!!! PLEASE Sprindale PD, PLEASE assist with this and do a DNA test!!! You are underestimating the severity of this case! And sherry is right, this IS how serial killers start! People like that need to be stopped. Best by a round of bullets in his chest. This guy is EVIL and People like that can’t be healed. They aren’t stupid! He knew exactly what he was doing so to claim insanity afterwards, as many like to do is scary beyond recognition! The Springdale PD should not take this case easy or brush it off as just an animal. This was extremely detailed work! Glad sherry has a gun! Sherry, not sure if you knew, I just barely thought of this, Sunday was Black Cat Appreciation Day!! It may have targeted the Cat more than you, even tho it’s still not less scary!! This is why my two cats stay indoors at all times. There are too many dangers out there, not just from cars and wild animals, but from evil humans. It has been a month since this was reported. Has anyone seen any follow-up information? Did they do DNA testing on the cat’s claws, or did anyone respond to the reward offer? That’s a lot of money, so a lot of people would jump at the chance to turn in a neighbor, relative, or acquaintance if they had evidence that the person was torturing animals. My neighbors cat was just found last week “top half only” early in the morning almost as if staged in the yard. No blood, clean surgical like incision, cautery cut no blood present, all internal organs removed. We are in Wilmington, NC there has been multiple cats go missing the last year, but none found dead and especially not in this way. I believe their is some sort of significance to this type of animal slaying, whether it be cult, or ritualistic killing. I have done some research and it is apparently something that has occurred many times and is growing over the last 10 years all over the USA. I think that it is a subject of interest and we need to really take notice. I cannot believe that they would even think about not in the DNA! this person will most likely be killing people very soon! I know this is a few months after this article was written but I just saw it, have they caught this person yet? This cat wasn’t killed by a person. It was probably killed by a dog or could have even been a coyote. It’s a common mistake people make. People do kill and abuse animals obviously but they usually leave some evidence that it was a person. You cant say a cat was killed by a person just by looking at it’s wounds though because dogs can leave injuries that look exactly like precise surgical cuts and when dogs do kill cats there usually isn’t any blood. People just dont realize that by letting their cats live outside they are placing them in great danger from all sorts of predators that roam around our homes at night.